The Witness is now up on PSN in the Americas and Europe. It should go up on Steam this morning around 9 or 10am Pacific time. Turning of the witness, looking for patterns around you, realise the game is so good that you are still playing it when it’s off. I am not sure where else to leave a message in hopes that mr. Blow or anyone involved with the project will see this, but I just wanted to personally say thank you. I love good puzzle games, and very good ones are so few and far between. This game is just excellent. You have done a very wonderful job, and I really really enjoy the game. Very sorry to hear it is being pirated so much. I bought my copy on the ps4, and bought one for a friend as well, and we both think the game is worth every penny. If I had more money, I would pay for more copies, just to encourage future projects from you. What is the final puzzle count? I just beat the game (well, found the ending anyway; I haven’t solved every puzzle yet). I’ll be honest, until I played the game, I wondered why a whole 3D world was created just so you could find the little line puzzles and play them. In my mind, they could have saved a bunch of time and just made a phone app with the same puzzles and it would have been just as good. Boy was I wrong. The way they integrate world into the puzzles is amazing. Just like Braid, everything in the game feels so tight and perfect. And it’s beautiful. I was sure that I’d get bored with the line puzzles after an hour, but it hooked me. Not sure how they did it. Even in Talos Principle you can jump, hack stuff with an axe, fall to your death, explode, get launched through the air, etc. But The Witness doesn’t rely on the usual thrills to pull you through. It relies fully on the quality and progression of the puzzles and the beauty of the world that they’re in. Jonathan Blow and his team have really raised the bar…again. I was excited to play this, but the PlayStation Store is unusable. There’s no way to change the country on my PSN account – when I created the account, it was set to US, but I live in Canada, with Canadian credit cards. So I can’t purchase it without jumping though a number of hoops. I’m looking forward to a physical release. i’ve been following your progress on the game since you started the blog. I was so anxious to see it finished and have it. Sadly I can’t spend 40$ on a game right now. I think the price is fair though, but i’ll have to bee anxious a little more until i can buy it. I’ve been playing the game for about 30 hours now (bought it on steam) and I’m nowhere near the end. Made a lot of progress though. I find it very addicting and captivating. The puzzles are among the best I’ve seen anywhere and the way they are integrated to the environment on the island is utterly brilliant. Jonathan and his team really outdid themself when creating this wonderful masterpiece of a game. Any puzzle game lover must play this as it’s among the best ever created. Content wise, it’s huge and also has many little secrets to uncover besides the main route, so the price is most definitely right. Overall quality is through the roof and most importantly, it’s very fun to play, though frustrating at times because it’s very challenging as well. To anyone who is considering to buy The Witness, don’t hasitate! Disappointment is not an option. I’m very interested to know if there will be a color fix added to The Witness for the 4-8% of us who are colorblind (~8% of all males). After coming up to an incompletable puzzle panel because of the muted nature of the colors, I have decided to no longer play the game. I feel like it is cheating to look up solutions to problems that I should be able to solve, and generally unplayable because I might have already learned rules that aren’t meant to be rules from the puzzles I’ve already completed. Also, here is a free program that does full monitor simulation of colorblindness. It’s free. https://www.facebook.com/photo.php?fbid=1107067209327849&set=a.1107067195994517.1073741830.100000737413319&type=3 -Should it be like this, or is it some kind weird bug? I’m not on a boat! Any word on what the plan is there? My previous save is over a hundred random puzzles back, and I’d rather not have to revisit it all, especially since it could happen again. That said, super awesome game. I don’t know if Jonathan will read this message but for me The Witness is the Fez 2 I was awaiting for without knowing it would come from Braid’s Creator. I follow Jonathan Blow as I follow John Carmack because they have a vision, they see things beyond the lines. They are both impressive when they speach about coding, the way they see it, the way they use it. But back to the Witness. I loved Fez. I finished it twice. At each end, you gained an object that allowed to see the whole game world differently. And all the game in Fez was about puzzles, about islands (I didn’t notice this correlation before writing it), about point of view , about scale and collectibles. I’m still on it, I haven’t finished it yet, but I’m close to the end and despite that, I know I will need to come back a lot of times to this island to unravel all of the little (and big) lines I missed all around the island and to decipher the puzzles I left aside so far and for which I now have most of the needed knowledge to get rid of. So thank you. Thank you for this great game. A game fan and an humble coder. Please port the game to Xbox one. I have a ps4 and have loved and beaten it already, but the piracy problem brings a tear to my eye and I already know a few people with xb1s that would pay money for the game. Best of luck, thanks to all, KEEP ORSI SPANYOL ON THEKLA!!! I have been playing computer games from the monochrome alpha-numeric screen days. Even before that (sub hunt on HP calculators). Needless to say, I’ve played zillions of games. I have just completed the ten “worlds” and I can easily state that this is the best game ever made. The most thoughtful, beautiful, brilliantly designed piece of gaming art. It is obvious on every square millimeter that Jon and his folks poured their hearts into it. You just created a masterpiece. Time to go into the mountain. God I don’t want this to end…. I’m closing in on the Platinum Trophy (played without any help!) and I want to express my utter amazement. It’s funny that a game without a plot features the most intense plot twist I’ve experienced. After the revelation – The Witness explained to me all those weird little quirks that made impressions but no sense. The level of intricacy and the interplay in some of the puzzles is mind boggling – Jonathan Blow must be a mentalist – he made you discover exactly the solution he wanted you to discover at a particular point in time or he predicted your actions given the knowledge you possess or he put a mind block which does not exist in the game but only as a self imposed rule. Sometimes the solutions come to you while doing something different (and maybe not even playing the game) and there are puzzles the solution to which is so spectacular that it leads to what, I guess, scientists feel when they make a great discovery – a religious experience in the sense in which Einstein used it, featuring in one of the in-game quotations. All the thinking The Witness stimulated – from math and logic, through observational science to philosophy and spirituality – having interest in all those areas it’s needless to say I found it deeply stimulating, engaging, and dare I say – even awe-inspiring and profound. I think The Witness will be important for a long time to come, it’s lightning in a jar, it sets the mark so high, that Jonathan Blow might not be able to surpass it again. So I say – bear witness to what video games can do. I bought the game last Tuesday for PS4 and I love it. I’m a little red-green colorblind by so far it hasn’t impeded my ability to solve puzzles or find secrets, including the ones that are based on color. I’m also a software engineer, and I do have a technical question about the game from that standpoint: when panel solutions are evaluated by the game software, particularly for panels that have multiple solutions, does it analyze the player solution based on the rules for puzzle the moment you reach the endpoint, or are all acceptable solutions pre-computed offline and each compared to the player solution (or some combination of both approaches)? I ask because it seems like some of the solution analysis must be computationally intensive, yet I never notice any lag when I complete a panel. With the horrible state of the economy, living in Canada, I was just wondering if there is any way to purchase a DRM-Free version with CDN and not USD. I plan to play the game on weekends at my country house (where there is no internet), so if I could avoid the horrible conversion rate, it would be great! Thanks in advance for what everyone around me has been telling me is a game created for me. Is there any plan to release the game on the Asian PS Store? I’m writing to say that your game was very resonant with me. My grandfather passed away when I was around 13 years old, and I have a distinct memory of looking at the bookshelves he left behind. Intermingled with books about the natural sciences — especially physics — there were an equal number of books about spiritual topics. He was an a Feynman fanatic, but he had also read countless religious texts, prayer books, and essays. Later, my mom told me about the Christmas where he asked for a gong. I had found it strange that an Aerospace Engineer, physics graduate, and casual Catholic would pursue this whole other world. I’ll never be able to ask him personally why his bookshelf came to look like this. But playing your game made me think: maybe his spirituality wasn’t just a hobby, a source of joy, or a practical tool for overcoming strife. Maybe it was a moral obligation for him to explore the world though that lens, one that demanded effort and fortitude. The videos and audio clips spelled out this argument to me, and the gameplay made me believe it. This may seem too schmaltzy and coincidental to be true, but it is, 100%. I was shocked by how strongly The Witness evoked that memory of that bookshelf. Nowadays it seems like nobody will touch spirtuality with a ten foot pole, let alone endorse it as a serious intellectual pursuit. I admire you for having the courage to put your cards down on the table and make something with such a bold pro-spritual stance. Your message is timely and vital. I was not a spiritual person going in, but you found a way show me a glimpse of the world through your eyes. I’m confident that others will see The Witness not just a great game, but as an extraordinary good deed. Seen videos of a little bit of the game and can honestly say that I love it and want a go so not gonna watch any more and spoil it but I need an Xbox one version as I don’t have PlayStation and my computer would not run this so hope we get one in the near future!! Really looking forward to this game. Do you have plans to release it on the Japanese PSN store? 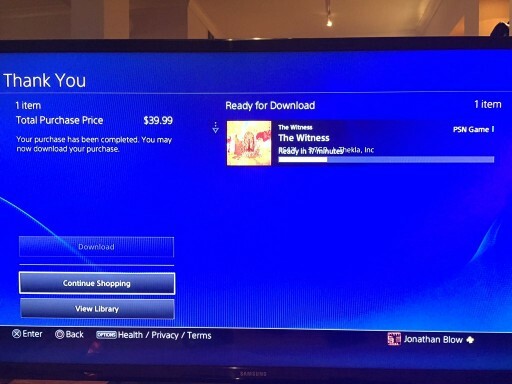 When will The witness available on PSN asia? This game is looking pretty great :D Just wondering when will the game be released on PSN Asia? Don’t forget developers, you’ve still got fans on the other side of the world! The Witness is a great puzzle game that I was enjoying a lot on PS4…until after a lot of hours of play and 7 “areas” completed, and many puzzles solved in the other ones, I fell in a game breaking bug. I get back to the quarry and get on the elevator, standing next to the rock wall, the elevator did go up… but unfortunatly without me on it. Theoretically you should have a back-up save (if you have solved enough puzzles) if you go to the Load Game screen. But yeah, this is an unfortunate bug. Will be patched. Many, many thanks for a wonderful kaleidoscopic expeience. Truly challenging but such fun! Since my last message I’ve discovered the back-up saves you’re talking about. But the game has made three or four back-up saves (that I was not aware of) of my first short sessions of play, and since then has always saved itself on the very same slot ; so that the bug comes to block my longest run of solved puzzles -it was 8 “areas” and somes other puzzles, about 350 puzzles solved. Moreover I would have expected that the back-up saves would have saved the game the moment just after the last puzzle solved, and not the last place I was standing. Sorry for reporting this bug, but the frustration is as high as “The Witness” is a clever and tricky puzzle game, full of great ideas. I suppose that the coming patch will prevent other players from falling in the same trap than me, but will not get me out from my confinment ? Or will it help to start again in the closest “safe place” ? Hi there, saw that the game was release on Xbox one on the 13th of September but impossible to get my hands on it. I live in Australia, is there any plans on getting the game all the way here? and if so when? thanks! When is the release date for Asia PS Store?